Lee Barrett has agreed to attend a storage auction with Aunt Ibby-even though she suspects the forgotten rooms will yield more junk than treasure. Her skepticism vanishes once the two win a bid on an overlooked locker and uncover a trove of beautiful curiosities, including a stunning wooden carousel horse with gentle eyes and fading paint. But just before Lee leaves the fairground relic at a local repair shop, the sight of a silver samovar awakens her psychic abilities and conjures visions of murder. Lee prays the intrusive ESP episode was just a glimpse into the past-until her policeman boyfriend reports a dead man outside the repair shop. Apparently, the unknown victim had been hot on Lee's trail since the auction. And with the horse found dismantled, it looks like he was up to no good. What's the story behind the antique equine, and could a strange bubblegum-chewing woman with fiery hair have something to do with the crime? 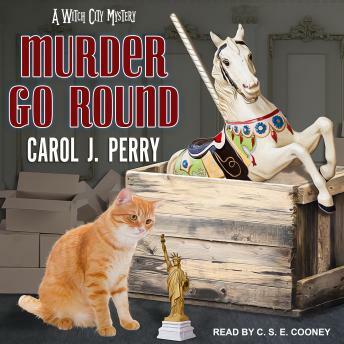 Guided by her gift and O'Ryan, her wise tabby cat, Lee's set on catching the murderer . . . before she's sent on the darkest ride of her life.